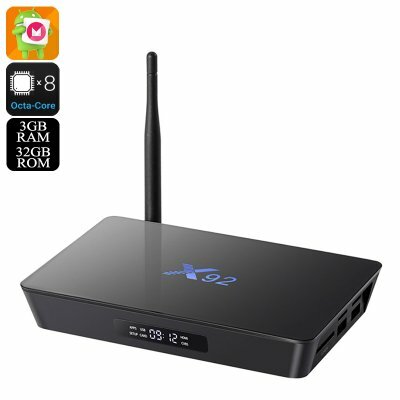 Successfully Added X92 Android 6.0 TV Box - 4K Movie Support, Miracast, Airplay, Google Play, Kodi TV, Octa-Core CPU, 3GB RAM to your Shopping Cart. Thanks to its Airplay feature, this Android TV box can be synchronized not only with you Android phones but also with all iOS phones and tablets out there – making it the perfect entertainment hub for Android and Apple users alike. With Miracast, you furthermore are able to mirror all that’s happening on your smartphone’s display straight onto your big screen TV – letting you take the most out of your television and all the features your smartphone has to offer. Ultra-fast WiFi connectivity additionally allows you to browse the web, stream movies, and download the latest media in the blink of an eye – truly turning your regular TV into a smart television. The X92 Android TV Box comes with a 12 months warranty, brought to you by the leader in electronic devices as well as wholesale electronic gadgets..
Arabic: - مربع التلفزيون ك 4 - Chinese Simplified: - 4 K 电视盒 - Czech: - 4K TV Box - Danish: - 4K TV boks - Dutch: - 4K TV Box - French: - Boîte de TV 4K - German: - 4K-TV-Box - Hebrew: - תיבת טלוויזיה 4K - Hindi: - 4K टी वी बॉक्स - Italian: - Box TV 4K - Japanese: - 4 K テレビ ボックス - Korean: - 4 K TV 상자 - Malay: - Peti TV 4K - Norwegian Bokmål: - 4K TV boks - Romanian: - Caseta de TV 4K - Russian: - 4K TV Box - Spanish: - 4K TV Box - Thai: - กล่องทีวี 4K - Turkish: - 4K TV kutusu - Vietnamese: - 4K TV Box.